HI! 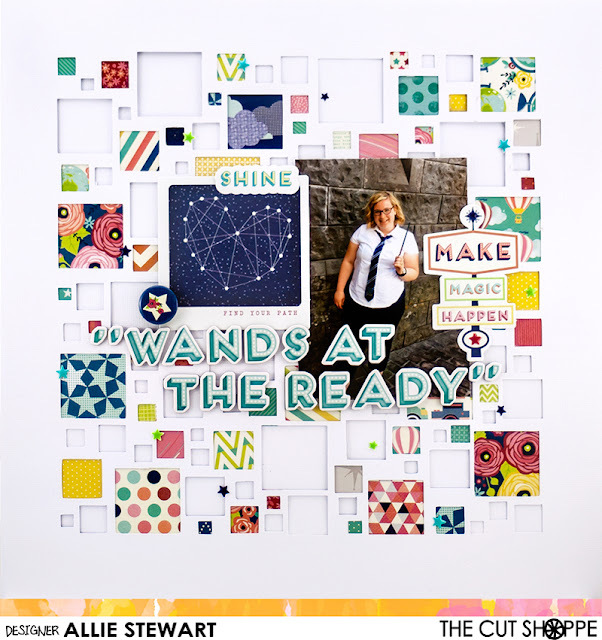 i layout to share with you using the Very Squarey cut file from The Cut Shoppe. This layout was inspired by a 6"x6" paper pad. I wanted to use as many patterns from it as possible, and was looking for a file that would be great for featuring the designs. Very Squarey was perfect! I backed some of the squares with paper, and left others blank. I love the look of white on white! I used the Shimelle Starshine collection and a photo of my wand and I at the Harry Potter theme park! I added bold title with thickers and some ephemera, but kept the embellishing on the simpler side.